The Bulls selected Tony Snell, a 6-7, 200-pound forward, with the 20th overall pick in the 2013 NBA Draft.Snell comes to Chicago from New Mexico with the reputation of a proven shooter and defender. As a junior, he averaged 12.5 points and 2.9 assists in 31.2 minutes per game. Snell shot 42.2 percent from the field, including 39.0 percent from three-point range. He leaves the Lobos ranked 10th all-time with 434 career three-point attempts, having connected on 38.0 percent. Snell brings great length to the Bulls, boasting a wingspan of 6-feet, 11.5 inches. He checked in at the NBA Draft Combine with a body fat of only 4.9 percent. He also expressed confidence he’d be able to meet the demands placed on players by head coach Tom Thibodeau and his staff with respect to defense. Originally from Riverside, California, Snell was a high school teammate of San Antonio Spurs forward Kawhi Leonard. The Bulls also own the 49th overall in the draft. BOSTON—So much for the Presidents’ Trophy curse.The Blackhawks ended one of the most exciting — and dramatic — Stanley Cup Final series in recent memory in what was perhaps the most fitting way possible: an improbable come-from-behind win in which they scored two goals in 17 seconds to earn a 3-2 win and give the franchise its second championship in four years.The Blackhawks were two minutes away from facing a winner-take-all Game 7 in the United Center. In less than a minute they managed to turn defeat into glory.It wasn’t their best perfomance of the playoffs, and they had to sustain a huge push from the Bruins in the first period, but in games like this you just have to throw style points out the window. The Blackhawks did what a champion is supposed to do and found a way to get it done when it mattered most.And it was something they did more than once this postseason.This is a team that had to overcome a 3-1 series deficit in the second round against Detroit and win three straight must-win games. Then they had to knock out last year’s champions — the Los Angeles Kings, who looked to be even better this year — in the Western Conference finals.The Blackhawks had to break through Boston’s Tuukka Rask, the hottest goalie in the NHL.And it was everybody coming through.The duo of Patrick Kane and Jonathan Toews, criticized earlier in the postseason for not scoring enough and being the focal point of a struggling power play unit, came together on Chicago’s top line and were the driving force behind their championship run.Kane, who already has a cup-clinching goal on his postseason résumé (and now two Stanley Cup rings), can add a Conn Smythe Trophy to his collection. No, you couldn’t. Actually, you couldn’t have scripted any of this series. Three overtime games. A wild Game 4 that saw the Blackhawks win a thrilling 6-5 overtime game that was perhaps one of the most exciting Stanley Cup Final games ever … that is, until the final two minutes of Monday’s game happened.And then there was Corey Crawford, the much maligned goaltender with the supposed shaky glove hand.Crawford, perhaps the biggest question mark on the team heading into the postseason and the focal point of one of the biggest storylines in the Final (the aforementioned glove hand), was stellar in Games 5 and 6. Heck, had it not been for Crawford’s play in the first period on Monday it’s possible that Boston could have put this one away early and completely changed the course of the game, extending the series to a seventh game. In the end, this Hawks team was simply the best team in the NHL. They proved over 48 games during the regular season when they finished with the best record in hockey. And they proved it in the Stanley Cup Playoffs.They were deeper than everybody else. Had more skill than everybody else. And they put it all together at the exact right moments.That’s what a champion does. Patrick Kane and the Blackhawks have that look again, and another Stanley Cup is within reach.Kane scored two goals, Corey Crawford made 24 saves and the Blackhawks beat the Boston Bruins 3-1 on Saturday night to take a 3-2 lead in the final.Kane had a terrific postseason when the Hawks won it all in 2010, including the winning score in a 4-3 overtime victory in Philadelphia that secured the title. Now he’s picking up steam as the Blackhawks move closer to another championship, collecting seven goals in the last seven games.Dave Bolland added an empty-net score and Jonathan Toews had two assists before leaving with an injury. The captain took a big hit in the second period and did not play in the third. The Bruins also lost one of their key players when Patrice Bergeron was injured in the second. It was unclear what happened to the star center, but the team said he was taken to a hospital for observation.Game 6 is Monday night in Boston.Zdeno Chara scored in the third period for Boston, which lost consecutive games for the first time since the first round against Toronto. Tuukka Rask made 29 saves, keeping the Bruins close while they scrambled to generate quality chances.Chara got a nice pass from David Krejci from behind the net and beat Crawford on the glove side to make it 2-1 at 3:40 in the third period. The whistling slap shot by the big defenseman came after he was on the ice for five of the Hawks goals in the Blackhawks’ 6-5 overtime victory Wednesday night.The location of Chara’s third postseason goal brought to mind the glove-side difficulties for Crawford in Game 4. But he held up just fine coming off the worst postseason game of his career.He gloved Daniel Paille’s slap shot early in the third, and the Blackhawks helped their embattled goaltender by turning up the pressure on Rask after the Bruins cut it to one. Kane forced Rask to make a couple of nice stops, and Michael Frolik also made a run to the net.The Blackhawks survived one last push by the Bruins after they pulled Rask, and the crowd of 22,274 roared when the overhead videoboard showed the No. 1 and the Stanley Cup on the screen, signifying the team is one victory away from its fifth title.The Hawks and Boston returned to the ice three days after they played the highest-scoring game in this year’s NHL playoffs. There were five goals in the second period alone, matching the total from the previous two games combined, and Brent Seabrook’s overtime score lifted the Blackhawks to the series-tying victory.It was a marked departure from the first three games of the finals, and raised questions about what the play would be like in the last part of the series. The answer, at least in Game 5, was a return to the strong team defense and disciplined play. It meant little room to maneuver in both offensive zones, especially for the series’ biggest stars.Only Kane was sure able to find enough space.With 2 1/2 minutes left in the first, Johnny Oduya’s long slap shot broke the stick of Boston defenseman Dennis Seidenberg and trickled to the left side of the net where Kane poked it in for eighth playoff goal.The line of Kane, Toews and Bryan Bickell, which coach Joel Quenneville put back together before Game 4, struck again in the second. Bickell was stopped by Rask on a rush along the left side, but skated behind the net and threw it back in front.The puck went off the right side of the goal as Rask got his blocker to the post. Kane then deftly backhanded the bouncing puck into the top of the net to make it 2-0 at 5:13.That proved to be enough for Crawford, who has allowed one goal or less in nine games this postseason. But this one had to be particularly satisfying after facing a barrage of questions about his glove over the past two days.Since the NHL went to a best-of-seven format for the Stanley Cup in 1939, the winner of Game 5 in a deadlocked series has gone on to win the title 15 times in 22 occasions.Those numbers likely don’t scare Boston very much. The Bruins faced the same situation against Vancouver in 2011 and came back to win the championship. NOTES—Former Blackhawks G Ed Belfour received a loud ovation and chants of “Ed-die! Ed-die!” when he was shown on the videoboard in the second period. … Actress Michelle Pfeiffer and her husband David Kelley, a TV writer and producer, attended the game. Hawks outlast Bruins 6-5 on Seabrook’s OT goal. Finals tied 2-2, back to United Center. It was the third overtime game in the matchup of Original Six franchises, but it bore little resemblance to the three tightly contested games that opened the series. The teams combined for five goals in the second period — as many as in Games 2 and 3 combined — as t bounced back from its first shutout of the season with its most prolific output of the playoffs. Bryan Bickell and Michal Rozsival had two assists apiece for the Hawks, who had scored only five goals total in the first three games of the series and hadn’t gotten the puck past Rask in more than 129 minutes coming into Game 4. Corey Crawford made 28 saves, coughing up the lead three times. Patrice Bergeron scored twice and Zdeno Chara and Jaromir Jagr each had two assists for Boston, which has won 11 of 14 playoff games; the three losses have all been in overtime. Rask made 41 saves but he was screened by Jonathan Toews on the game-winner, which quickly e Hawksquieted the building where Boston had earned a dominating, 2-0 victory two nights earlier — the only Blackhawks’ shutout of the season. 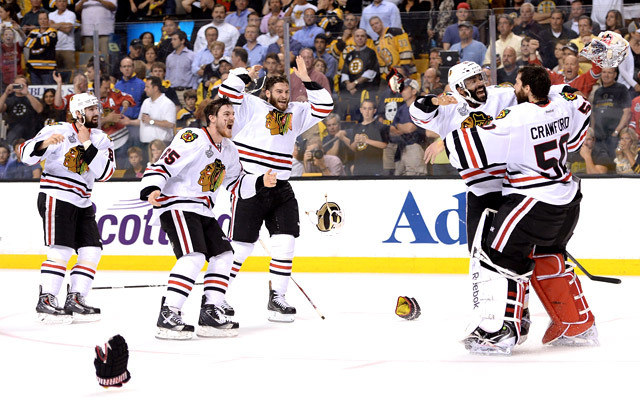 The Blackhawks led 1-0, 4-2 and 5-4, but each time the Bruins evened it up. The last, just 55 seconds after the Hawks took the lead, came when Johnny Boychuk slapped it over a sliding Johnny Oduya with 7:46 left in regulation. Boychuk, who had never scored more than five goals in a season, has six in the postseason. Seabrook plays heroSeabrook’s OT winner evens Stanley Cup Final The overtime was even until the Bruins failed to clear the zone, and the Blackhawks got the puck to Seabrook at the right point. What seemed like a harmless shot eluded Rask, and the Blackhawks followed with a subdued celebration at the end of another long night. The Bruins had trailed for under 60 minutes total of the almost 900 minutes they had played in the postseason. But the Blackhawks came out strong early in this one, recording the first seven shots and taking a 1-0 lead on a short-handed goal when Oduya was off for interference early in the first period. Brandon Saad picked Tyler Seguin clean in the defensive zone and brought the puck down the ice before flipping it across to Michal Handzus, who rattled it in off the post to make it 1-0. That snapped Rask’s shutout streak that dated to the first period of Game 2, but the lead didn’t last for long. None of them did. The Bruins tied it on the power play when Andrew Ference kept the puck in at the blue line, and Rich Peverley finished it off with a wrist shot. But it was in the second period that the teams really opened things up.Toews tipped in Rozsival’s shot to put the Blackhawks back in the lead with 6 minutes gone. Just over two minutes later, took its first two-goal lead of the series when Kane converted a rebound to make it 3-1.It stayed that way for six minutes before Milan Lucic deflected Chara’s shot into Crawford and then put back his own rebound to make it a one-goal game. Forty-nine seconds later, Kruger stuck with the puck until he had poked it past Rask and into the net to make it 4-2. That’s when Boston got some luck.Chara’s shot from the center of the blue line deflected off Crawford’s left shoulder and over the net, where it hit the back wall, bounced back onto the top of the net and landed in the slot, right in front of Bergeron. He chipped it in to make it 4-3, then tied it two minutes into the third. Patrick Sharp gave the Hawks a 5-4 lead with 8:41 left in regulation — on an assist from Marian Hossa, who missed Game 3 with an undisclosed injury — but it lasted only 55 seconds before Boychuk tied it. NOTES—Bruins Hall of Famer Bobby Orr, who also played briefly for the Hawks, was in the crowd, waving a yellow towel in support of the Bruins….Boston killed 29 consecutive penalties dating to Game 5 of the Eastern Conference semifinals, including the first 13 Blackhawk opportunities of the Final…..The Blackhawks had the first seven shots of the game despite a penalty that left them short-handed…..Jagr assisted on both goals by Bergeron, giving the 1999 NHL MVP 199 career postseason points. He is fifth all-time…..Midway through the first, Boston’s Shawn Thornton hit the scoreboard when he lofted the puck out of the zone. Hawks scoring slump continues as Bruins win 2-0 for 2 games to 1 lead. Corey Crawford made 33 saves for the Blackhawks.Game 4 is Wednesday night in Boston before the matchup of Original Six franchises returns to Chicago for a fifth game. The teams split the first two games there, with the Blackhawks winning Game 1 in triple-overtime and the Bruins stealing home-ice advantage on Paille’s goal in the first OT of the second game. But this time the intrigue came before the opening faceoff instead of after the end of regulation. Bruins defenseman Zdeno Chara and Marian Hossa both left the ice after warmups. But while Chara needed just some stitches after his collision with teammate Milan Lucic, Hossa was a late scratch with an unspecified injury. Hossa, who has three game-winning goals in the playoffs this year, was tied for the team lead with 15 playoff points and was third on the Blackhawks with 17 goals during the regular season. It was a loss the Blackhawks couldn’t afford.Not with Rask stopping everything that came his way. Rask, who was a backup to Conn Smythe-winner Tim Thomas in the team’s 2011 Stanley Cup run, didn’t face as difficult a test as in the first period of Game 2, when the Blackhawks sent 19 shots at him but managed just one goal. But he stymied them all game and got some help from the post on Bryan Bickell’s shot with 42 seconds left in the game.The puck caromed off the right post and the goal light flickered on briefly, but play continued for another 30 seconds before the whistle blew and the game degenerated into fisticuffs. Chara was on top of Bickell, pounding away, and Andrew Shaw got the better of Brad Marchand.By the time it was all sorted out, the benches were a little emptier but the scoring column for the Hawks was still blank. “You’re playing the last five minutes of the game, you know they’re going to throw everything they can at you,” Rask said. After a scoreless first period, the Bruins made it 1-0 when Paille slapped in the puck at 2:13 of the second, falling to one knee for extra power. It stayed that way until late in the second, when the Bruins picked up their first power plays of the game on two nearly identical plays, with a Bruin racing to the net and a Blackhawk undercutting his skates and sending him crashing into the left post.Boston set up their offense during the 11-second two-man advantage, and just five seconds after it expired — but before Dave Bolland was able to get back into the play — Jaromir Jagr slid one across the middle, past Lucic in the center to Bergeron on the other side for the easy one-timer.It was Jagr’s 197th career playoff point in 199 games, moving him into sole possession of fifth place on the NHL’s all-time postseason points list. NOTES—Jagr had been tied with Paul Coffey on the career postseason scoring list…..Two of Jagr’s playoff points came on goals scored against the Blackhawks when they were swept by Penguins in 1992 final……Boston’s Gregory Campbell, who broke his leg blocking a shot in Game 3 of the Eastern Conference finals, attended the game……The Bruins have killed off 27 straight penalties in the playoffs…..Boston’s David Krejci entered the game tied with Andrew Sharp for the most goals in the postseason with nine. The Bruins center entered the game leading all scorers with 23 points…..The Bruins are attempting to win a Cup for the second time in three seasons for the third time in their history. They also did it in 1939 and `41 and again in 1970 and `72…… Bruins won their seventh straight home playoff game…..The Blackhawks fell to 3-5 on the road in the postseason…..Ben Smith, who played just one game this regular season and none in the playoffs, replaced Hossa in the lineup…..Stalberg replaced Brandon Bollig in the Hawk lineup. Hawks stopped after one period, fall to Boston 2-1 in OT. Series tied 1-1. The Blackhawks played one great period Satruday night, but scored just once, and no more after that. After giving up a goal and withstanding another 18 shots in the first period Saturday night, Boston Bruins goalie Tuukka Rask may as well have hung a “Not Open” sign on his net. While he stymied the Blackhawks, his teammates regrouped and found enough offense for a 2-1 overtime victory that sent the Stanley Cup finals to Boston tied at one game apiece. Rask finished with 33 saves, including stopping Game 1 winner Andrew Shaw cold in OT.Game 3 is Monday night in Boston. “We had the perfect start to the game, then we stopped doing what made us successful,” Blackhawks coach Joel Quenneville said. Well, Rask had a lot to do with that. Rask needed his head on a swivel to keep track of the traffic, and even that wasn’t always enough.At about 11 minutes into the first period, the Blackhawks blitzed Rask with a series of shots, two from Patrick Kane and one from Michal Handzus. Rask handled all of them, but the puck squirted out to the right side where Sharp was waiting.With Rask still preoccupied with the scrum on the opposite side of the net, Sharp poked a goal past him, putting the Hawks up 1-0. It happened again shortly after when Marian Hossa appeared to score. But officials waved off the goal, saying play had been stopped.When the first period finally ended, the Blackhawks had a 19-4 shot advantage. Boston’s defense tightened up, and Rask easily handled the few remaining chances the Blackhawks had. The Blackhawks had only 15 shots in the last two periods and overtime. 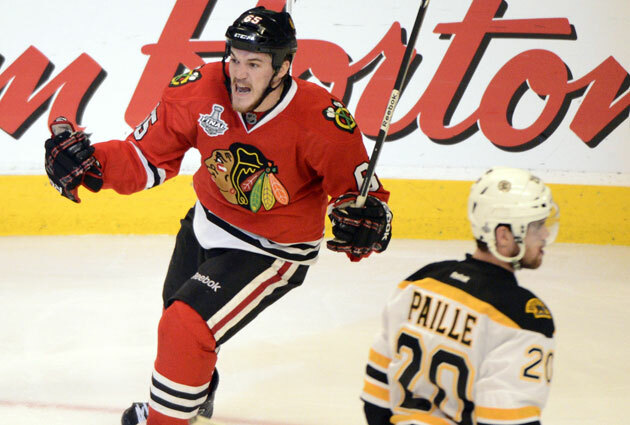 Andrew Shaw skated off to the side and pumped his arms furiously.One shot from the right point plus two deflections was just enough to beat Tuukka Rask in the fifth-longest Stanley Cup finals game in history.Shaw skated in front of the goal in the third overtime and redirected Dave Bolland’s shot into the net for the winning score in the Blackhawks’ 4-3 victory over the Boston Bruins in a riveting Game 1 on Wednesday night.Michal Rozsival started the winning sequence with a shot from the right point into traffic. Bolland tipped it before Shaw got it by Rask for his fifth goal of the playoffs.And just like that, the longest finals game in five years was over. Milan Lucic had two goals and an assist for the Bruins, who had won five straight and nine of 10. Patrice Bergeron scored a power-play goal and David Krejci finished with two assists.Rask made an astounding 59 saves in the longest finals game since Pittsburgh beat Detroit 4-3 when Petr Sykora scored at 9:57 of third overtime on June 2, 2008.Game 2 is Saturday night at the United Center. 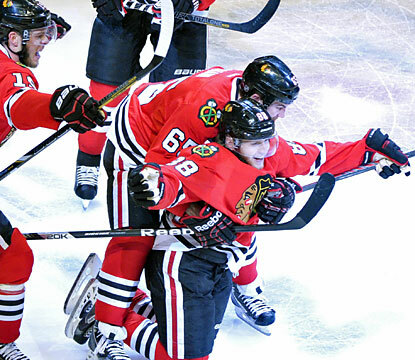 The Blackhawks won for the eighth time in nine games and improved to 10-1 at home in the playoffs. Bolland and Johnny Oduya scored in the third period for the Hawks, who never would have made it to the third overtime if not for an impressive performance by goaltender Corey Crawford. Brandon Saad had his first goal of the playoffs.Crawford gave the Blackhawks a chance by standing his ground when the Bruins had repeated opportunities in the extra sessions.Shawn Thornton and Daniel Paille skated in for a 2-on-1 in the first OT, and Crawford turned away Thornton on the doorstep. He denied Rich Peverley and Tyler Seguin in rapid succession, and helped the Hawks kill two power plays when it was whistled twice for too many men on the ice.Nathan Horton hit the post in the first extra session, and Zdeno Chara’s slap shot deflected off Jaromir Jagr and then the inside of the right post at the very end of the second overtime.Crawford had 22 of his 51 saves in the first two overtimes, and Rask was forced to make 18 stops. The action was so fast and furious that it took a toll on the players with Horton skating off during the power play with an injury — likely a serious one to leave the ice during that pivotal moment.Bergeron scored on a slap shot went off the stick of Blackhawks defenseman Niklas Hjalmarsson and made it 3-1 at 6:09 in the third period. It was just the fourth power-play goal allowed by the Hawks in 59 playoff chances.The Blackhawks responded with more pressure on Rask, who stepped up when he faced a similar attack from Pittsburgh in the Eastern Conference finals. This time, he coughed up the lead, hurt by one unlucky carom.First, Bolland converted a nice pass from Shaw for his first goal of the playoffs. The pesky Bolland had three goals and three assists when the Blackhawks beat Philadelphia in six games to win the 2010 Stanley Cup.Then Oduya’s long slap shot went off the left skate of Boston defenseman Andrew Ference and into the net for the tying goal with 7:46 remaining in regulation. Oduya’s shot was going wide if it didn’t hit Ference’s skate. The sellout crowd of 22,110 cheered as Krejci and Chicago captain Jonathan Toews stared each other down for the opening faceoff of the first Stanley Cup finals between Original Six franchises in 34 years.And it almost didn’t happen.Game 1 came exactly five months after the official end of a long and bitter lockout. The labor dispute wiped out 510 games, but the sides managed to come together in time to save an abbreviated 48-game season and playoffs.They were rewarded with a final playoff series between two big-market teams with passionate followings and scores of top players. Led by Toews and a group of skilled forwards, the Blackhawks returned to the Stanley Cup finals for the first time since they won it all three year ago. Boston won the title the following season, and the same core of players is at the center of this year’s playoff run. Boston countered with a Rolling Stone: Mick Jagger tweeted a picture of himself holding a Bruins jersey before a show at TD Garden.The Blackhawks landed a few big hits early on, but the Blackhawks chased the Bruins around for much of the first period. So much for all that talk about the Hawks speed and skill versus Boston’s strength and power.A missed check by Hjalmarsson proved costly when Krejci threw the puck in front of the net to Horton, who passed to a wide-open Lucic for the first goal of the series at 13:11 in the first.Lucic set up his second goal with a little dirty work. He won the puck in a scrum along the boards, got a pass from Krejci and fired it into the right side just 51 seconds into the second period, extending Boston’s lead to 2-0 with his fifth goal of the playoffs.The two-goal lead looked like a sure bet with Rask in net, but the Blackhawks found a way to get back into the game against the red-hot goaltender. Marian Hossa stole the puck from Dennis Seidenberg in the Boston end and fed Saad, who one-timed it past Rask at 3:08 in the second.Saad’s goal ended a scoreless streak of 149 minutes and 36 seconds for Rask dating to Game 3 of the sweep against the Penguins.That got the crowd going again, and the Blackhawks drew a pair of penalties in rapid succession to earn a 5-on-3 power play for 1:17. With the prime opportunity to move into a tie, they passed the puck around too much and the Bruins easily killed off both penalties. LAKE FOREST—The Bears bolstered their defensive line Tuesday by agreeing to terms with veteran tackle Sedrick Ellis on a one-year contract. New Bears defensive tackle Sedrick Ellis pressures Oakland Raiders quarterback Carson Palmer. The 6-1, 307-pounder spent the last five seasons with the Saints after being selected by New Orleans with the seventh overall pick in the 2008 draft out of USC.Ellis started all 70 career games he played for the Saints, recording 174 tackles (99 solo), 12.5 sacks, 13 pass breakups, two forced fumbles and one fumble recovery.He registered 30 tackles and four sacks in 13 games as a rookie, helping New Orleans win the Super Bowl. Ellis started all 16 contests last season, compiling 36 tackles. He joins a defensive tackle group with the Bears that includes veterans Henry Melton, Stephen Paea, Nate Collins and Corvey Irvin. The Bears spent much of their offseason beefing up their offensive line in an effort to help protect Jay Cutler. But they’ve made a move Sunday that will thin out the corps, reportedly trading Gabe Carimi to the Buccaneers. Carimi flew to Tampa on Sunday and will be a Buc provided he can pass the physical.It looks like the Bears won’t get much in return from Tampa, as Adam Schefter of ESPN reports that the compensation is just a sixth-round pick.That speaks highly to the scrutiny that Carimi’s been subject to this offseason. After the Bears went out and signed Jermon Bushrod to a big free-agent deal, they drafted Kyle Long out of Oregon in the first round to play guard.Just as Long was signing his rookie contract, Carimi was skipping voluntary workouts.And though Bears GM Phil Emery made a point to note that Carimi wasn’t required to attend those workouts, it became clear the 2010 Outland Trophy winner was upset about being squeezed from a starting job on the Bears line.Carimi was drafted to play tackle and started out his Bears career at the right spot, but after undergoing knee surgery during his rookie year, Carimi was moved to guard in his second season.With Matt Slauson at left guard, Long at right guard and Bushrod/J’Marcus Webb manning the tackle positions, there wasn’t a starting spot left for a first-round pick from the previous regime.As such, Carimi’s headed out of town. Though he might look like a throwaway at this point for the Bears, this is the type of move that could come back and haunt them if someone on their offensive line goes down early in the year. Patrick Kane scored his third goal of the game 11:40 into the second overtime period and the Blackhawks beat the defending champion Los Angeles Kings 4-3 to advance to the Stanley Cup Final on Saturday night.Corey Crawford made 33 saves and Duncan Keith scored in his return from a suspension as the top-seeded Blackhawks eliminated the Kings in five games in the Western Conference finals.The Hawks will host the Eastern champion Boston Bruins in Game 1 on Wednesday night. Boston completed a sweep of the Pittsburgh Penguins on Friday night.This is the first finals matchup of Original Six franchises since 1979, and it will pit two of the last three champions against each other.The Hawks won the Cup in 2010, ending a 49-year drought. Boston captured the title the following year.Anze Kopitar and Mike Richards scored in the third period for Los Angeles, which trailed 2-0 after the first period. Jonathan Quick finished with 31 saves.Kane was in the middle of a quiet postseason when he finished off Bryan Bickell’s shot for his third playoff goal in the Hawks 3-2 win in Los Angeles on Thursday. The talented forward yelled in relief after that goal and came up with his best performance of the playoffs in Game 5. After Crawford made a couple of big saves in the first overtime, Jonathan Toews carried the puck up the left side during a 2-on-1 rush in the second extra session. He then made a cross-ice pass to Kane, who one-timed a shot past Quick and into the right side.The rollicking sellout crowd of 22,237 erupted in joy as Kane skated back toward the middle of the ice and slid on his knees as hats rained down. A distraught Quick laid down as his teammates emptied from the bench for the post-series handshakes.